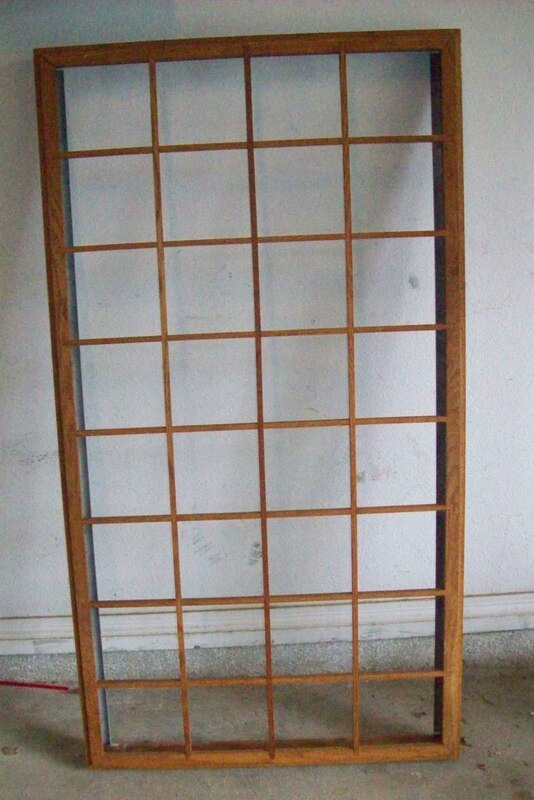 I came across this large window pane type light fixture at a yard sale about a month ago. I tried talking myself out of it; even walked off twice, but, in the end, it was only $5, which was truly a bargain. The woman told me it had been the kitchen overhead light fixture in her Mothers House and she'd brought it home to convert it to a trellis for her garden ... a project that apparently never happened. I knew exactly what I would do with it, just took me a month to decide where to place it when it's finished. This is, really, the crucial decision, as its' placement dictates the colors. After measuring a variety of places, I decide it will hang in the guest bedroom, which currently is clothed in earthy type colors. This piece measures 4'2" x 2'2"; it's the largest window light box I've made so far. 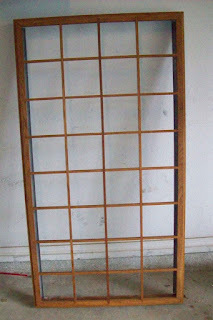 -- Took the frame to the garage and lightly sanded to remove finish. Applied a coat of wood reconditioner (it is very dry with raised grain) and let it sit for a couple hours. -- Selected and brown paint, watered it down a bit and reapplied in a distressed fashion. 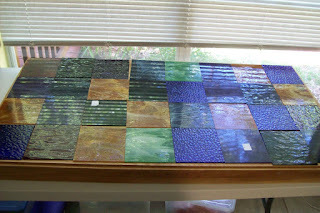 -- Dug through my stained glass sheets and selected colors that were somewhat earthy. A couple of the pieces are a bit of a stretch, however, the goal was to use up some of the existing inventory; I certainly don't want to go out and buy more glass at this stage. -- Cut 16 panels that are 6" x 6". -- Cut 16 panels that are 6" by 6 1/2". Picked it all up and put it away. Lilly is coming to visit tomorrow and I don't want to risk having glass out on which she might get cut. I"ll pick up a light fixture and appropriate hardware at The Box and continue working on this over the weekend.